Kengezi base - a Congolese border post between Sudan and the Democratic Republic of Congo (DRC) - is located around 120km north of Aru. This part of the territory was occupied since 1996 by the SPLA (Southern Sudan Liberation Army), which used it as a base against possible infiltrations of the LRA (Lord' s Resistance Army) in South-Sudan. In 2004, during the creation of the mixed FARDC integrated brigades, the troops of the 1st brigade were deployed 5km from Kengezi, in Rumu, but did not have instructions to evacuate the SPLA, with whom they were living peacefully. In July 2007, Governor Autsai Asenga, on mission in Aru, ordered an FARDC meeting for border troops. The Congolese soldiers then left Rumu barracks to settle in a new base in Kengezi, built 900m from the border. A barrier was set up 300m from the border, and several border services were established there. On the evening of 23 January 2008, according to the authorities of Aru territory, a high ranking SPLA officer arrived at the barrier, dismantled it and drew down the Congolese flag. On 24 January, the FARDC replaced the barrier and returned to their new barracks. Briefs contacts followed between officers of the two camps, without results. The Sudanese ex rebel were uneasy with the new FARDC barracks and demanded the FARDC to leave their base and return to their old base in Rumu. The FARDC did not agree with the proposal. 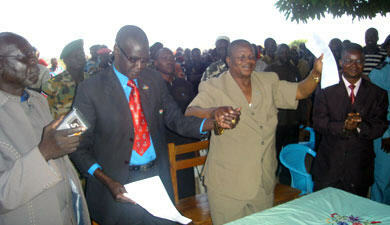 The SPLA then launched an ultimatum to the FARDC to leave, set for 1pm. The commander of the 1st brigade ordered a company based in Kumuru, 24km from the border, to arrive as reinforcements. On their arrival, and shortly after the expiry of the ultimatum, the SPLA fires and the FARDC retaliate. According to the Congolese territorial authorities, only one soldier is wounded in the FARDC ranks. In the following days, humanitarians present in the area counted more than 3,000 displaced persons from the surrounding villages. Intense negotiations took place on 25 and 26 January, and military and territorial authorities from both sides refuse to budge. The Sudanese side insists that the negotiations should be held at the higher governor level. In the meantime, a seven day truce is concluded. Upon his arrival in Aru on 1 February last, Orientale governor Medard Autsai Asenga informs MONUC of his intention to go to Kaya in Sudan the following day, to meet his counterpart from Central Equateur province, Major General Clément Wani Konga, “to calm the spirits” of the soldiers and the local populations. Its important to note that the mission of Governor Autsai and his delegation - in particular General André Kinkela, FARDC Ituri operations commander, Colonel Hassan Masudi, commander of the 1st integrated brigade of Aru and Mahagi, Mr. Mawa Enzoronzi, administrator of Aru territory, and a representative of the Police chief of Ituri district – appears to have been a success. Indeed, the agreement signed on 3 February last in Sheba, in the district of Morobo, not only brought an end to the Kengezi base crisis, by reiterating the will of the two countries “to reinforce their good neighbourliness in order to consolidate peace in the area”, but marked an unambiguous return to the layout of the borders inherited from colonisation. The agreement also envisages a calendar of quarterly meetings for better effectiveness in the fight against fraud and smuggling at the border. The two governors also addressed the populations. Thereafter a symbolic ceremony was held in Kengezi base where the two delegations re-hoisted the Congo flag at the border post. As of 5 February, the independent measures decided by the Sheba agreement were applied. All SPLA troops left the locality, which is now made secure by the Congolese National Police. In relation to the 3,000 displaced persons around Kengezi base, this agreement also gives hope that they will return to their villages soon. This is what UNICEF and OCHA want to encourage, after an evaluation mission by the NGO Solidarité which ended on 2 February last. The World Food Programme (WFP) also envisages to supply emergency food aid.